ID Barbers & Hairdressers Logo & Brand Identity Designed by Freelance Logo Designer The Logo Smith. There are a number of aspects to this logo, not all immediately apparent. A significant part is actually a location concern: the shop is a Grade II listed building full of oak beams and original brick work. The overall feel of the logo needed to be clean and stylish but in keeping with general feel of the village. The client had certain aesthetic tastes with the interior and exterior decoration of the building. I wanted to take these account where possible. The brief also made it very clear that this was to avoid typical male barbershop clichés, specifically styling with red and white stripes and the like and overall over the top cliché imagery. The shop would be open to all ages, it needed to hint at the style conscious young men as well not alienating the older generation. There are a few sport shops that cater for the skateboarders and bikers in the same road, so a logo was needed that didn’t conjour up a more traditional mens’ barbers. The shop would include plush sofas, sound system, 42″ LCD and Playstation 3 of all things for those waiting for a trim. 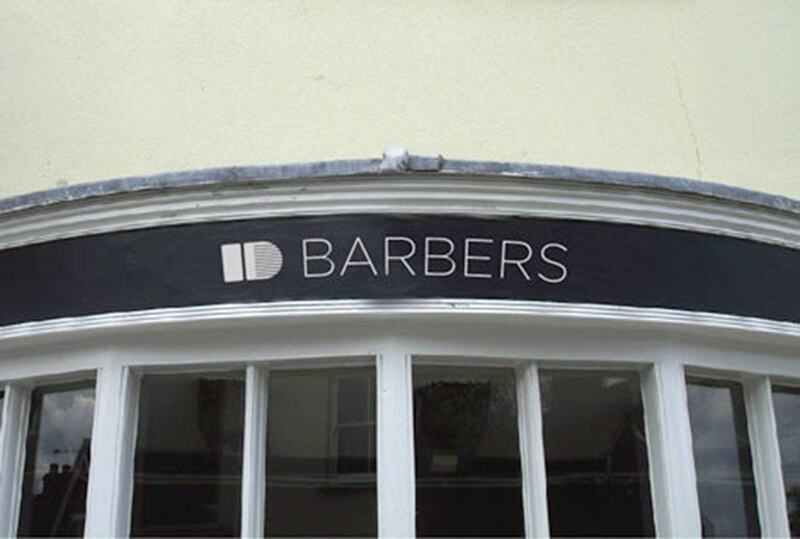 The logomark, the ‘ID’, needed to be able to stand alone for signage purposes as well as working alongside the main ‘barbers’ wording. Without adding to much clutter to the logo as a whole, I wanted to incorporate a subtle hairdressing association within the ‘ID’ letters. I was able to integrate a reasonably ‘non cliché’ association with the letters ‘ID’ using a comb/grader/shaver/clipper.